In our own low-budget way, we do try to keep up with the garden. Over the ten years we've lived here, we've turned it into a tidy, functional, yet low-maintenance garden, despite the drawbacks of heavy clay soil and either full sun or total shade in parts. One aspect that has been letting the garden down for some time though, is the ageing, grotty patio and recently, we got the chance to finally do something about it. Read on to find out how the Karcher K2 Compact stepped up to the task and see the results in our before and after pictures! This post is not sponsored, we borrowed the pressure washer from a friend. 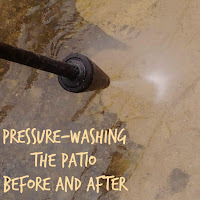 In our previous garden makeover post, we attempted to clean the patio using bleach, but it wasn't very successful and we really felt a pressure washer was our only hope. We actually wondered if even that would work, but more on that later. The Karcher K2 Compact is really easy to use, and takes just a few minutes to set up. 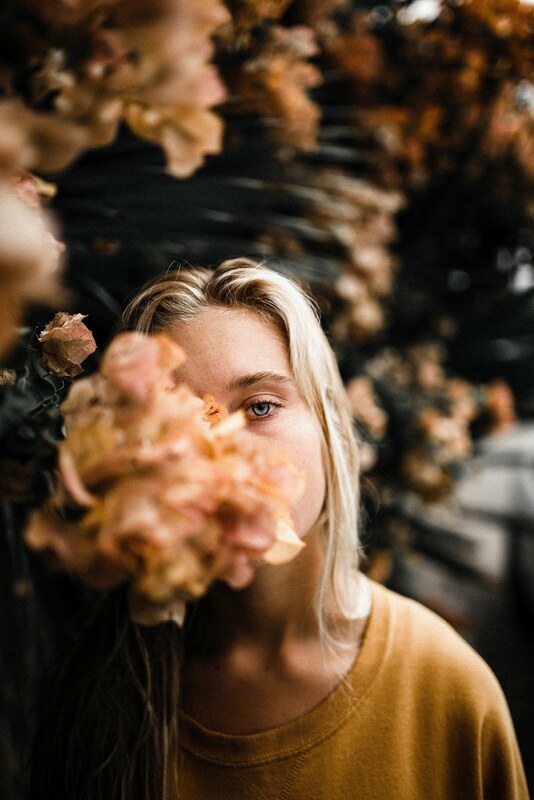 It's powerful, but not too powerful that it's hard to control. As we borrowed it, we didn't have all the attachments but if you buy the Karcher K2 Compact on Amazon, there's a patio cleaner attachment, which makes it even easier, and you can add detergent too, if you want to. We just used the jet nozzle and water, so you can probably get even better results with the right equipment. 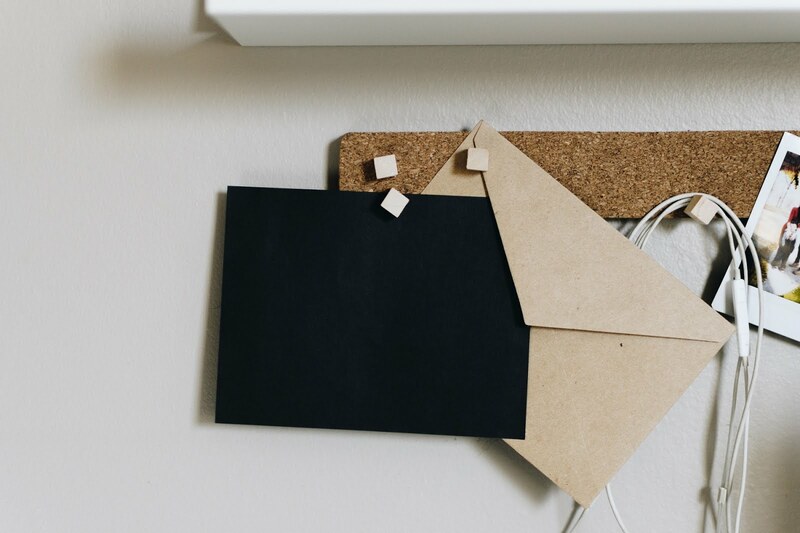 The process was surprisingly quick and we saw results immediately. 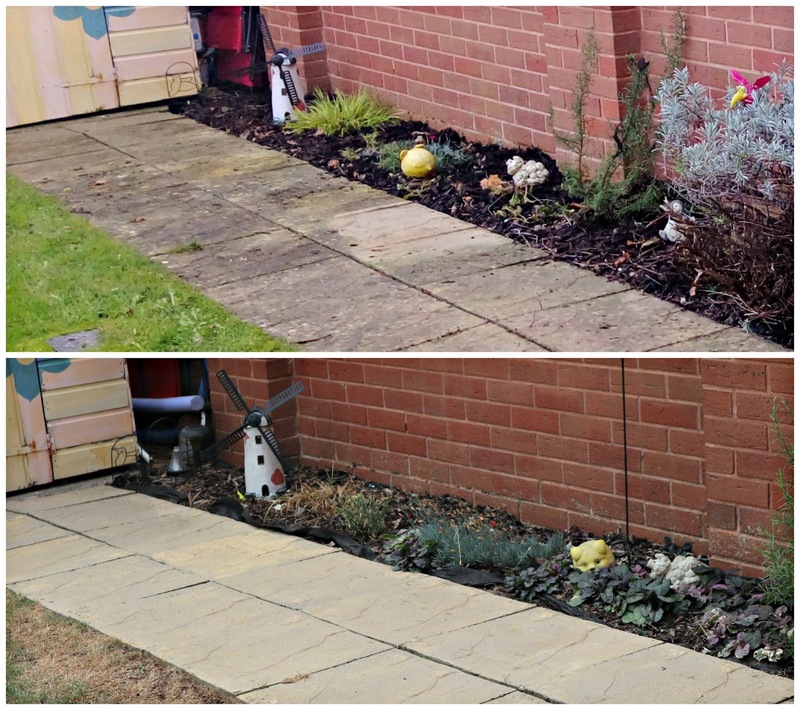 The first photo was taken last year and the second one is just after we'd finished with the Karcher, which took around twenty minutes. The only draw back was that the powerful jet caused the water to spray up around it, leaving a coating of grime on everything nearby. We had to clean off the shed door, and some pretty sad-looking garden ornaments too, which wasn't too much effort, while the mud was still wet, but it would be a good reason to get the patio attachment if you can. According to the reviews I've seen, it apparently minimises the mess caused by the water jet. You can get pretty coated yourself, and I would definitely recommend wearing old clothes and wellies or flip flops when using the Karcher jet nozzle. 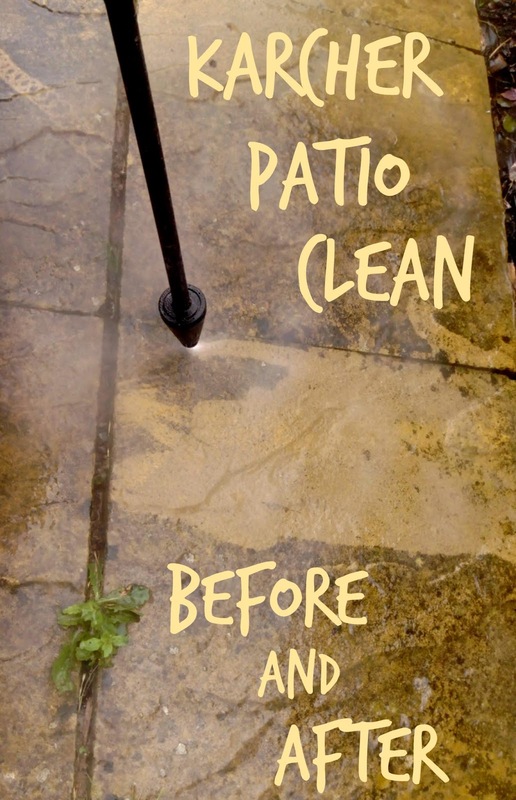 The real test for the device was the patio area that we had previously failed to get clean. Could this device do a better job? You can judge for yourself, with these handy before and after photos. I think you'll agree that it has made a massive difference and I think it was well worth the effort it took, which wasn't actually as much as I had expected. The garden seems bigger and brighter now, and what turned out to be a relatively quick and easy task has really cheered the place up. 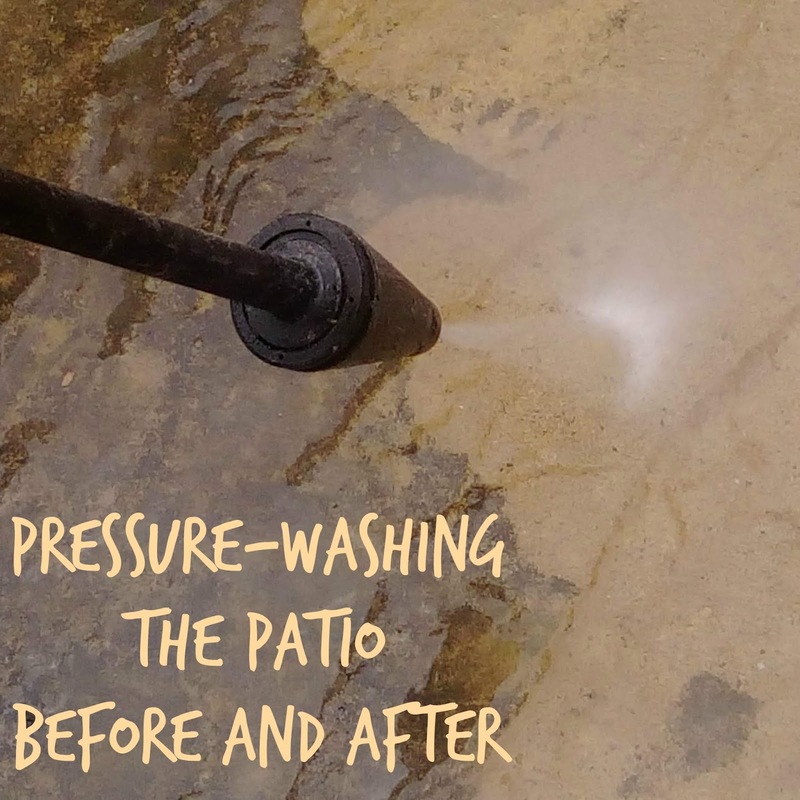 We borrowed the Karcher, because we were unsure if it would actually work, but now we've seen it in action, we would certainly recommend getting one if you can, it takes years off your garden!